Time for a short update, I guess. My petrology class and the undergrad group that accompanied us returned last night around 9 pm. Well, technically that was when the last of us got in -- the other two cars chose to go on ahead of us once we crossed back into the U.S. It was a good time! Lots of great old basalts in surprisingly good condition, especially when the whole vesicular (high surface area), billion-plus year old petrified lava thing comes into play. We took many pounds of samples and enjoyed some REALLY nice weather along the lake shore. Pictures to come after I've had some more rest. Also: I have arsenides in my room. Bwahahaha. Don't worry, I know how to handle them safely, and I won't let anyone else touch them. Or lick them. School starts and this blog gets boring. Typical. Notre Dame week and prepping for no less than TWO research projects. And working all the while. The only interesting (read: unpredictable) events are SMB gigs and my knee, neither of which are interesting enough to post about. So, 9 am rehearsal tomorrow and bed as soon as the laundry's done. This is me, five years ago at Freshman Dress 2004. I came back from the gig I played tonight to find a bunch of old pictures in one of my old section leader's albums had been tagged, so this was sitting at the top of my home page. Recent Studies Have Suggested . . .
. . . That one keeps growing until about the age of 21. Initially published sometime while I was in high school, that gave me hopes late in high school that I could make it past the mark of 5'7" I've been hovering near since the early 2000s. However, we've also known, thanks to near-identical elementary and middle school projects, that my wingspan has consistently been 1/2" longer than my height. It's also well-known that it's nearly impossible to find tailored shirts that fit my frame correctly. No one, apparently, expects a female to be somewhat skinny and have broad shoulders/long arms at the same time. That means I'm forced to wear shirts that, while fitting my arms and sometimes my shoulders, might otherwise appear scruffy because they're baggy. If I go for fitting to the torso, there's an inch or two of wrist poking out of the sleeves! Very frustrating. We did a couple of rough measures yesterday, and yeah, I seem to have grown an additional half an inch in height. I was okay with that, then Mom suggested measuring my wingspan. I was expecting to fall within the half-inch surplus measured in the past. Nope. Figured out where my extra growth went. Let's just say that if height were measured in one's wingspan, I would be 5'9", maybe 5'10". Oh glorious football has begun. Please no commentary about any broadcasting quibbles, coverage, etc. here. All I'm doing here is expressing the pure joy of the season beginning today. I've been waiting all summer for this!!! Definitely harboring mixed feelings about this one. Exhausted and glad to be able to sit and rest, but it's my last one ever. All good things do eventually come to an end. Leadership sessions and fundamental review today, as well as a nice little 2.5 minute run -- roughly a half a mile or so 'round Munn. I've been fighting this crazy headache thing for about a week. Finally gave in tonight and bought some Excedrin for the painkiller+caffeine duo and it seems to be helping. Bag of ice does wonders as well. It's not debilitating, thankfully, but annoying and distracting. No more house centipede sightings, but I also left my light on when I went out for the football gig this evening to try to prevent them coming out after sunset, since I'm not unpacked enough to start putting poison down on the perimeter. Annnnnd it's late. There's a tornado show and a replay of the ASU victory over the skunkbears. Up at 7:30 am. This is why I shouldn't hook up cable till Preseason's done. Happy Birthday, Sasquatch! We miss you!
. . . Teh Prof says it's a "typical gneiss," but I've never seen a "typical gneiss" look like this thing. Our hand samples must be a little too . . . perfect. EDIT: To clarify, our hand samples are also never boulder-sized. -Rode past Dem Field ony my way to work and saw they had the lines painted and Grounds was mowing the field. Marching season has begun! -Spent the day (while at work) trading the occasional e-mail back and forth with my research professor regarding my intentions to head up this weekend to gather some field samples. -Left work early and headed to my research prof's office to discuss field work in person. -Nearly had to can researching what appeared to be a very promising site. Prof makes a call and finds that the technique used in the last published work at the site is considered outmoded now, so research is ON! -Headed home for the night. -Breakfast @ Sophia's Kitchen with Webmomster. Omelets and delicious chocolate chip pancakes. Walked to and from. -Back to the house to load the Guyz into the car and take off for the Great White North. Got the dogs out of Webmomster's hair so she could get some work done around the house. -Reach the cabin, say hi to the Commander, fall asleep on futon? Check. -Walked the beach, said hi to the amethyst rock and the mystery boulder, and got rained on. Cool but not cold. Gathered a half-cup of blueberries just before twilight. -Wrestled with the futon. The futon won. -Say hi to Jan, load up car, listen to conversation, realize what time it is, take off for home. -Wrestle with horrible traffic from Bay City to Grand Blanc. -Ate a delicious dinner and checked out Frumious's new casing, being a hard drive independent from the FrankenBook. Copied music and photos (4.51 GB . . . wow) and documents (oh my) to the BlackBook. -Decide to stay the night since Nook's out with friends till ?? and don't want to disrupt. -Stay up too late to write this? Check.
. . . The final disassembly of my trusty iBook of the last ~4.5 years. I'm typing now from a brand new "BlackBook" (black MacBook). As I've gotten it configured, it's started to feel a little more like "home," but won't be fully so till I can get the data off of my old computer. With a little elbow grease and a little case to run the hard drive from my iBook out of, making this computer "home" shouldn't be too hard, hopefully. Once I can find my way to an open wireless network, I can get online from the brand new iPod Touch that came with! Alas, the solder job was my last stand. I can't keep fixing it like this. Not an hour after I posted last night, I had the Frankenbook running in my room, and I jogged it - nothing bad (normally), mind. It promptly went into "I'm gonna sleep because I think the lid's closed" mode again (and again, staying as such), and this is making me think there's another component near the lid catch that's broken, and a. I don't want to do any more surgeries; they are exhausting and interfere with energy levels I should be putting toward running, and b. I don't know if I can fix that part anyway. So, in light of the "Nothing Else I Can Do" situation and the Frankenbook's undead state, I'm currently *under orders* to pick out a new computer. Now comes the other tough decision: do I buy a new computer this weekend, or wait till the end of September for the big product line upgrade? I've been looking at the features rumored to be appearing in as early as a month and a half (probably right after the back to school deal ends, which is September 15th). The MacRumors blog has entries pointing to a major redesign of both the MacBook and the iPod Touches (options available to me RIGHT NOW with the student discount). -Transition from plastic case to an aluminum case (not in favor; heat & impact protection issues. Metal will not protect the guts of the computer during a drop/fall as much as plastic. Given how this Frankenbook deal started, this is a concern of mine). -Structurally (aside from the metal casing), the new MacBook is rumored to have a more rounded shape, similar to that of the Air. Dunno how that affects the tensile strength/impact resistance of the metal case, which is something I'd like to discuss with an Apple tech as well. -One of the BIG rumors is that this is going to be a transitional model to a "tablet"-style laptop, so there is potential (as always) of significant software/firmware bugs. Currently, the iPod Touch features music/movie capability, full-screen touch, aluminum casing on the back side, WiFi connectivity, and the ability to surf Internet/e-mail. The back to school deal allows for the possibility of an 8GB model only. Small capacity. -First upgrade since Sept. 07 release. No one appears to know much more than that regarding the iPod Touch. Hopes are for it to be rid of the aluminum backing and have 3G connectivity. Many seem to think it will start to emulate the features currently seen in the 3G iPhone without actually being a phone: camera, 3G, GPS, etc. So this is what I'm mulling over today. If the Store were closer, I would not hesitate to go there TODAY (since I'm not at work -- power's out in the building I work in) and pulling some rapid-fire questions at the techs/reps. Looks like maybe Sunday morning, I'll zip down to Troy to ask about data backups and do some heavy questioning with a possible purchase, hopefully back to East Lansing in time to partake in some grueling-but-refreshing Series rehearsals in the afternoon. So, to continue with computer-related posts, the latest incarnation of quirky behavior from this machine I discovered today after work. Powered it up to make sure it would boot without going to sleep (check), tried unsuccessfully to connect to Arialzone (check), then closed the lid and went downstairs to make some (not so good) microwave dinner stuff. Get back upstairs with food in hand and check the computer, only to find it appears to be OFF. Open lid, hit power button --- and the display reactivates. It had just turned the display off (normal for my custom battery settings). No sleep. Must've fixed it too well. Also suggests that the previous malfunctions may have been the computer thinking the lid was closed because of some sort of disconnect between the offending part and the motherboard. It DOES sleep normally when I select the option from the menu. All in all, I'm hoping it stays this way, because I will take the extra steps to sleep this thing over the alternative any day and everyday. Anyway, I'm putting up a few more pictures from out West. I'm sitting in front of the (defunct) Burger Down just across the street from campus and am yanking MSU Wireless from Burkee Hall, because it's too nice to languish in my room. This is the Grand Prismatic Pool in Yellowstone. It's not as spectacular from the ground as it is from the air, but it's still beautiful. I have some great panoramics of this. The color progression is unbelievable. Ol' Faithful. It was pretty cool. They have benches ringing most of the way around the geyser and we were there with approximately 500 other people when it erupted (sometime around 1:30 pm). There are several eateries, a visitor's center, and a HUGE gift/food/more food/indoor court thing nearby. Definitely one of the (if not THE) place people in Yellowstone appear to flock to. Back to the Tetons. I love this range. Apparently the French did, too (give you one guess what "Tetons" translates to). Took this right after sunset and a GREAT dinner. This is from one of the first sites we went to in Yellowstone. Can't remember the name, but I could point it out on a map for you. This was an area riddled with small hydrothermal pools. They drained off into the lake and deposited these spectacular iron oxides mixed with some other stuff -- maybe sulphur? Back to the Grand Prismatic Pool area (sorry for the random, I really don't like how Blogger handles images and I'm too lazy to fight with it)! This was in the mid-afternoon and one of the last sites we visited. We spent most of our time there alternatively steam-bathing (in slightly sulphurous steam), marveling at the hydrothermal pools, and watching this beauty of a high-base thunderstorm roll in. In the foreground is one of the smaller pools preceding the Grand Prismatic Pool. The color contrast between the mineral deposits on the ground and the storm above was pretty cool. So right now I'm sitting right next to the Beaumont Tower and picking up wireless from the library. I'm hoping this lasts at LEAST the next two weeks. The co-op where I'm staying is still in one piece! It's humid like you wouldn't believe (still not used to this airborne moisture phenomenon), which slowed up tonight's run considerably. That and the 5 hours all told on the road today probably didn't help. Anyway, the Arialzone network, so pervasive throughout the "historic district" just off campus is actually working, which means teh Valdemort has Internetz!!! Who knows how long this will last, but I'm making full use of it while I can! Tomorrow is back to work and bug chasing, unless the bossman or the other bossman have new MM5 assignments for me, which would be welcomed! Bo-nanza. One of the many aspen groves. They speak. Not telling what they say, though! The Grand Tetons. Simple shot just past dusk. Liking the soft light in this. Tetons and Yellowstone deserve their own post, which I'll take care of tomorrow. I have many fine photos from both parks, some of which you might've seen already. More Bonanza! Looking to the southern part of the mapping area. Celebrating the Fourth in Utah. The Chateau's in the foreground. It was insane, seeing how many people showed up in our little dog park/Frisbee field. Sledding on remnant snowpack! This was near the end of our second Bonanza field day. We were leaving the next morning for the Tetons, so by 3 pm just about everyone, faculty included, lost focus and we kinda dicked around for a while before heading back to the vehicles. FrankenBook is Resurrected . . .
Yep, the piece in question, though not detached like I had thought, did indeed need a few hits with the solder gun and the computer's been functioning as perfectly as a 4.5 year old computer can! Webmomster's about to take off for Troll-land, so it's sign-off time for now. I'll illicitly post again at work. Missing my field camp folk! Apparently I either did not use enough superglue or it just doesn't handle heat well: one of the display components separated from the motherboard and my computer, while still operating perfectly, is receiving bad signals because of that disengaged component and going to sleep. Power back up, goes immediately back to sleep, repeat ad nauseam. Time to go find the solder gun. When I'm back in Michigan. Sorry y'all, no pictures till I can access them in some way or another. I promise lots of Grand Teton and Bonanza goodness. No pictures of the crap on the fault line, though. No one in Utah has heard of a spudger. My hinge was in four pieces. I fail at finding the Gateway shopping area in SLC. iFixit lacks directions to disassemble one's monitor. I had to improvise. I have two screws and a little plastic disc, all of which probably belong to the monitor. Screw you, Apple techs. I can fix parts and you want to do the whole damn thing. SUCKAAAAA. Broke my computer. It still runs perfectly. My roommate distracted me with what was floating in the toilet earlier this afternoon when we returned from the field (it was grass), and I had my laptop perched on the window ledge, the only place I could get Internet access at the time. I walk the 4 feet over to the toilet, where my roommate was standing, and we both jump at a *CRASH* from behind me. Laptop is on the floor with the monitor bent back a little too far. pick it up. Wow, I can see the monitor hookups. Check the hinges? Okay. One hinge is sheared. Plastic case is fine, and the computer is functioning perfectly (okay, as perfectly as a 4.5 year old computer that's on its 3rd hard drive, 2nd OS upgrade, and had a RAM installation will work, which is surprisingly good). Okay. Turn computer off, try to realign aluminum hinge. No go. Probably bent, because it's trying really hard not to move. Okay, call Mom, have her zip some directions to the nearest Apple Store. Turn computer back on, finish project with screen propped against the wall, print project and directions to downtown Salt Lake City, eat dinner, head out. Get to the Apple Store, and there are no more open slots at the Genius Bar. Talk to the nearest rep I see -- consults a tech. Takes the computer back to the repair room, and I'm left to wander the floor for a while. While the estimate's taking place, I fell in love with the iPod Touches. Will have to get one of those after my Gen 4 iPod kicks it. Tech comes back out and she tells me that they have to send it out and they have to replace the entire lid section. $600. Totaled. %@&#!!!!!! However! There is another option. I can buy a whole new computer for just a couple of hundred more with my student discount. Okay, call Mom and discuss. Need more details on computer replacement. Find tech, talk to tech. Turns out it's just "buy a new computer," which she recommends. No surprise, they are salesmen first and foremost. Call Mom again, decide to hang on for the rest of field camp and replace the computer when back in Michigan. Roommate and I wander around downtown SLC for a couple of hours till most of the shops close. NICE PLACE. I was a little distracted and upset at having totaled my electronic companion of the last 4.5 years, so I couldn't enjoy it fully, but I was overall having a good time. 9 pm rolls around and we head back to Park City, and I boot up my rather flaccid computer to check mail and hunt for hinge parts. I had decided during the drive home that I couldn't justify replacing a computer that's functioning really well. After all, it's been in pieces before this. Multiple times. Checked out teh Google and found some places where I could buy a 12 inch iBook hinge. $29, free shipping to the Chateau. Okay, pretentious Apple Store techs, take that! The new hinge ships tomorrow, and I've downloaded instructions from iFixit (thanks, GG!) already. So no, I don't have to retire this computer yet. Maybe in a year. The techs were surprised that I'd already isolated the problem and tested for functionability before getting there. They must deal with some really incompetent people. The bit I don't get about this whole problem is that yeah, it's a PITA to replace components in iBooks, but they're techs. This is *not* an uncommon problem, as my quick searches have revealed. I didn't really even scratch the surface of the results I turned up, and I saw lots of posts detailing exactly my problem. Too bad they can't charge me $50 for labor and parts and just sauck it up and take the damn thing apart. You don't need to replace the ENTIRE lid section, because the monitor sure as hell ain't broken. And it sure ain't worth $600. On that note, time to prop my trusty laptop against the wall for the night and head for bed. Hiking 2.5 miles tomorrow because the Forest Service won't open the road for the day tomorrow. Not sure why . . .
Pictures of the Tetons still to come. Pans are assembled, and they turned out REALLY well. Working on the Bonanza project. Pictures of the Tetons to come later. And we have no Internet. I'm typing from the window ledge because I can pick up what I'm guessing to be the library's wireless connection. When Kurt resets the modem, I'll have some pictures! By the way --- everyone must go to the Tetons. They are amazing. Yellowstone is a hop, skip, and a jump away to the north as well. Standing atop an oyster bed at 7500 feet with a 500+ foot drop behind me! Lunching in the Midas Mine. The Dump Chief. Oh the SMELL. Wishing we could swim in the reservoir! Roadkill at the end of a long mapping day. (Reposted photo) These are not the drinking shoes. Some shots I've been collecting for the last couple of weeks from some of our mapping areas. More posts to follow in different categories. Off to Nevada for more mapping and some mine tours. Back in four days, I think? Too tired to make a real post tonight . . .
My next real post is going to be amazing. I've been gathering material for it for several days. Our "day off" will be spent driving to Nevada. I like mapping . . . a lot. Who knew. Back from the field on time today! Today was part 1 of a two day field mapping project. The only comment I will make about it is that agates are present in the Quaternary wash. No surprise, since we were finding them in southern Utah washes back in March, but still cool to come across. Still haven't mailed myself the shots from my cell phone, but here are a few other fun pictures from the last three days! This is the Chateau Apres. Hoity-toity-sounding name, no? This has been the site of the Wasatch-Uinta field camp for about 40 years now, and according to the directors, hasn't changed much in that time. It's in very good condition and considerably more modest than most of the places around here. Food's pretty decent as well. We carry sandwiches into the field, and one must be downstairs by 6:20 am to get the sandwiches you prefer! This was taken at about 10000 feet. I'm estimating, so for all I know I'm 1000 ft off one way or the other. 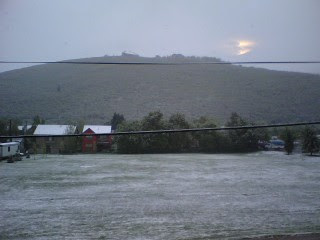 This is looking back toward SLC and Park City. This is from Empire Pass. Huge oysters in Jurassic age sandstones. Frontier Fm. This one is about 9 inches long and apparently these get up to one foot long! That's some serious aphrodisiac. This was making everyone nervous yesterday. We had the cold air mass that produced the snow this morning forming those clouds and a decent amount of rain for the climate here, and there were heading directly for us. The system was producing strong, chilly headwinds that were pretty much cancelling out any warmth we were getting from the sun at that point (a considerable amount!). Just a neat shot during a break from today's mapping. Stinky boot garden after our triumphant return! This is one of the first things I saw today. It's 6:30 am here and it's 34 degrees out.
. . . Welcome to Utah. Sorry, no pics yet. Some are downloaded from the camera and still need to e-mail the ones I took on my cell phone to myself. Maybe I'll do that between sites tomorrow. -Overdressed this morning. Better than underdressing! Being a Midwesterner, it's easy to forget how much one warms up in the sun out here despite the cool morning temperatures. - ~1/3 mile hike up the Wasatch Fault at our first stop. I'm acclimated to 600-850 foot elevations, having grown up in a basin. : ) We're at roughly 7000 feet, and the atmosphere thins on a more or less logarithmic scale. What does that mean? 1/3 of a mile up a mountain face and I'm panting like I just sprinted a mile. For that matter, so was everyone else. We'll be acclimated in a couple of days, thankfully, and then we can start the "real" geology instead of just hanging out at road cuts. -Speaking of which, we were looking at a Permian age outcrop at one of our sites, and someone drove by, shouting, "FIND A DINOSAUR!!" Hee hee. I wish, except for the small problem that, um, dinosaurs came a few million years later. -Large black beetles around these parts really seem to like hanging out on the back of your neck. -One day in the field and I'm sunburned. Some will fade overnight as usual, but I am definitely breaking out the long sleeves tomorrow. -Do not, I repeat, do NOT, sit in an ant pile. I don't care if you aren't aware it's there. Thankfully no fire ants. Regardless, these buggers are VERY temperamental. And the Chateau has wireless, which only started working after I reset my Airport card twice. I'm at nearly 7000 ft. elevation, and it's mostly clear. Currently about 60F with light winds, so overall VERY pleasant! Took us three days to get here. We left Friday morning and camped that night just west of Omaha, in a little state recreation area in Louisville. Louisville appeared to be largely industrial and likely a major stop on the transcontinental rail lines. The park bore evidence of the recent nasty weather, as most of the empty campsites had several inches of standing water. We picked out a dry campsite, only to find out it was literally 30 feet from the train tracks and every time a train came through, it sounded like it was going to derail, especially to those of us with very active imaginations! We left around 8 am the next morning and struck out again along I-80, then took I-76 when it branched off at the Nebraska-Colorado borderline and headed for Denver, where we met up with a recent MSU geology grad who attended field camp last year. We grabbed dinner at a local brewery and hit up a few bars later. Nursing a hangover this morning, I deferred the first driving shift and napped for a while, then took the second shift, fighting one hell of a wind the entire time. The drive home will be nice -- we'll have a prevailing tailwind and gas mileage will be otherworldly (the good kind, not the otherworldly we saw on the way over here). So that meant back on 25 north to get back on 80, then we took 80 through Wyoming (LONG, barren, cold drive) and into Park City. I probably knew at some point that Park City was one of the Olympic affiliates of the Salt Lake Games, but hadn't thought anything of it till we got into the city and started seeing world-class ski jumps and Olympics 2002 stuff everywhere. Very clean, organized, nice-looking city. Affluent -- many of the houses probably go for half a million at lowest around here. Dinner's at 6, and it's 5:42. Time to go see if I can move the car to a proper spot, then prep for dinner! Pictures to come later! One more post for the night! I can't resist. As all (approximately two) of my readers may know, I'm a fan of sunsets. Sunrises are cool too, if not more, however that involves hauling my arse out of bed in the mornings to see them! 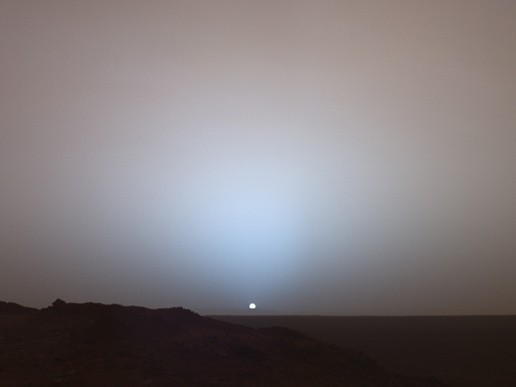 Anyway, here's a pretty cool picture from NASA's Image of the Day series of a sunset on Mars, taken by the Spirit rover. Thanks to BoingBoing for posting this! T-minus 2 days till Utah! Or maybe 3 . . . In the meantime, enjoy a close-up of the famed Neoproterozoic-era Noonday Dolomite (Mosaic Canyon, Death Valley, CA). Sorry for the lack of scale; the bands are roughly centimeter-scale. Another of the Great Geological Mysteries of the planet, its formation is contested. When we discussed possible origins while visiting the site in March 2007, the popular hypothesis was that the banding is of biogenic origin (GSA abstract for the curious). If so, it would be similar to examples of Late Archean banded iron formations (BIFs), which originated as stromatolites. Later, sediments entrained between algae layers lithified and under went diagenesis or other processes to become these BIFs. Similar processes may have produced the Noonday Dolomite. Mosaic Canyon is one of the many slot canyons found in Death Valley. The color and banding of the dolomite is well-preserved because of the extreme dry conditions. However, water is one of the primary forces sculpting the rock into such incredibly smooth (and really slippery!) surfaces. At left is a (kinda bad) photo looking down one of the narrow channels incised in the dolomite by fast-moving waters and sediment. Again, apologies for a lack of scale in the photo - the width of the "channel" (obviously not the main channel) is approximately a foot and a half wide. Most dolomites found in the field tend to be greyish as a result of regular weathering and are unremarkable in appearance. Death Valley is a cool place. For a taste of some more of the myriad geologic interests of the area, check out the Wikipedia overview: Geology of Death Valley. Webmomster had the rest of my Death Valley pictures online, but I can't seem to find them. Oh well -- ask and you shall receive! Guess I should start packing for field camp . . .
Blog cleared and given a new breath of life. Unpublished old posts, changed the layout and URL. Purpose: Document random geology stuff, mostly research (general comments) and Wasatch-Uinta. It'll probably branch out, if it lasts. EDIT: Welcome to the (lava) tubes.